Over the course of FPS history, developers have created many, many weapons. They come in all shapes and sizes; ranging from the realistic, e.g. Counter-Strike and Modern Warfare, to the fantastical, e.g. Unreal Tournament and Team Fortress 2. As time has passed, some of these weapons have stood above the rest. Whatever it is about these few special weapons, they're just more interesting, more intriguing, and more fun to play with. I'm sure everyone has their own set of favorite FPS weapons from the games they've played, but here's my top 5 picks for most fun FPS weapons. 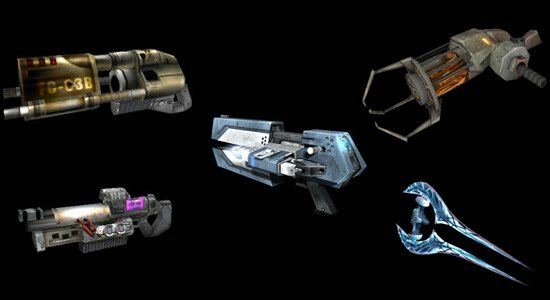 The Halo Energy Sword, from the original Halo to Halo: Reach, has always been fun to both fight and wield. The Energy Sword is one of the few weapons in which I never feel cheated when I die to it. More over, it's the only super weapon in an FPS, that I've seen, that's also a melee weapon. 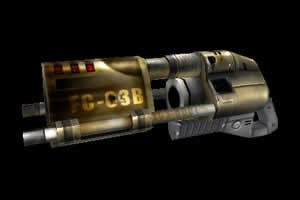 In Halo: Combat Evolved, this weapon wasn't usable by the player, but the occasional elite tried to chop you in half with it. This provided both a challenge, and broke up the usual pace and feel of combat. 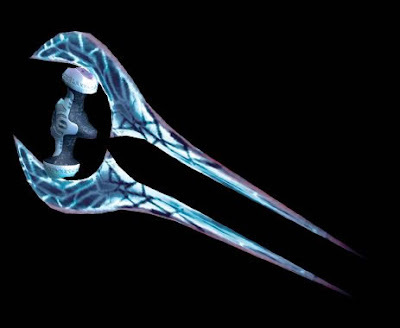 From Halo 2 on, the Energy Sword has become a staple of the Halo franchise. Its super weapon qualities in the damage department means it kills people in one hit. However, its trade off for this power, is that it's a melee weapon, therefore forcing you to engage your enemy at close range. If you do end up in a ranged battle, its rather simple for your opponent to take you out before you close the range. This restrictive nature of the Energy Sword forces players to pick their fights. In Energy Sword fights, with the melee restriction and the high damage, players with and without energy swords start to jockey for position. This positional battle, which forces players to not only know where to shoot, but also where to run, adds an interesting depth to sword combat that isn't present anywhere else in Halo. 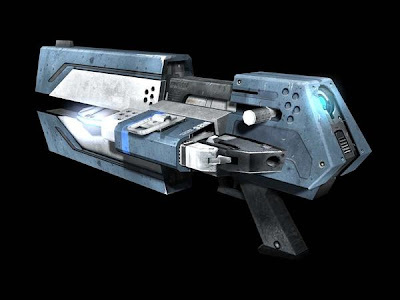 The Shock Rifle is arguably the most versatile weapon in Unreal Tournament. It's a good weapon at any range, and if used by a good player, can do horrendous damage. Its primary fire is an instant hit energy beam. This beam does decent damage but can be difficult to hit with when the opponent is moving. Its range is virtually infinite, however a lack of a scope on the Shock Rifle limits its sniping ability. The secondary fire on the shock rifle is a slow moving plasma ball. This slow moving projective does a lot of damage if you can hit someone with it. It also does a small amount of splash damage upon impact with an object. By itself, this fire mode is okay at close range, though hard to hit with thanks to its slow speed. It is mainly used for its small splash damage by firing at a players feet. A combo attack is also possible with the Shock Rifle. If you fire the plasma ball and then hit it with a energy beam shot, it will cause a big explosion that does quite a lot of damage. This combo can be very deadly. The Gravity Gun in Half-Life 2 was monumental when the game first came out. It was ground breaking, being the first to use physics as a tool and weapon. Objects in the world, that aren't too heavy, can be picked up by the Gravity Gun. These objects can then be moved around and launched at enemies. If the object is too heavy, it can instead be push around with a force punch ability. Being able to use objects as weapons means the whole environment becomes your weapon. You no longer have to wait for your enemy to go to the explosive barrel, the explosive barrel can instead come to them. If explosive barrels aren't your cup of tea, how about saw blades. Are pesky zombies trying to kill you? Just chop them in half with a saw blade force punched into their stomach. The game world is your deadly object ridden oyster. 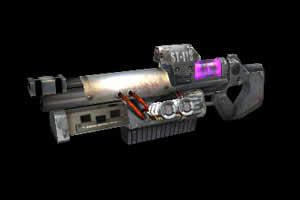 The Flak Cannon is the second weapon on this list that comes from Unreal Tournament and is my favorite and most used weapon from that game. It's a close to medium range weapon that is easy to use, and in the hands of a good player, can do incredible damage. Its primary fire is a shotgun spread of molten metal. This first firing mode lends itself well to medium to close quarter strafe battles, and it's relatively easy to hit with at least some of the molten shot. These molten pieces don't do much damage individually, but at closer range, if you can hit someone with the full spread of this shotgun-like blast, it will severely wound or kill them. The secondary fire of the Flak Cannon fires its explosive shell intact instead of in a shotgun spread. This shell explodes on impact, doing massive damage to players it directly hits and decent damage to those in the immediate vicinity of the explosion. This fire mode is great for lobbing at players around corners or for those times you're having trouble hitting with the primary fire. Combining these two firing mode makes for a very fun and versatile weapon. Use the primary at close range to do major damage. At longer ranges, you can do more damage with a hit from the secondary fire if you can lob it correctly. This weapon is a balancing act between distance, movement, and aim. 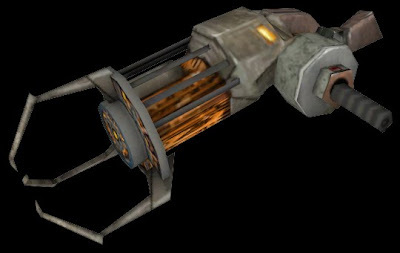 The Spinfusor or, as I remember it, the Disc Launcher is the cornerstone of weapons in Tribes. For a game that's all about jetpacks and movement, it's the perfect fit. The Spinfusor fires a high speed explosive disc which creates a pretty blue fireball upon impact with an object. This explosion is fairly large and does high damage at its center which quickly falls to little damage near the edges. If you can hit a player, it will do even more damage. In Tribes, players spend most of their time jetpacking around in the air. While in the air, players become near impossible to hit. However, player inevitable run out of jetpack energy and have to at least tap the ground, by landing for a second or two, while their energy recharges. In Tribes, being on the ground is the most vulnerable you can be. This ground tapping creates an opening for the Spinfusor. By judging when and where the enemy player will tap the ground, you can time a disc from the Spinfuser to hit that spot at the correct time. Since the explosion is large, you don't have to be perfectly accurate. However, the closer the player is when the disc explodes, the more damage it will do to them. You can try to hit the enemy while they are in the air, but you will miss with most of your shots. This creates a fun dynamic where players have to wait for their opponent to tap the ground for a second in order to do damage, and even when the opponent taps the ground, you still have to get the timing correct in order to take advantage of their momentary vulnerability. This post originally appeared on Lost in Neurons on Monday, March 21, 2011. As part of a clean out of Lost in Neurons to make it more focused, it has been moved here, where its author feels it better fit. Don't forget that the Flak Cannon's fletchettes also ricochet from any solid objects. Slipping behind a corner will not save the target, no matter which fire mode you use. Just to let you know, both the shock rifle and flak cannon were both introduced in the original Unreal with the same function, albeit with a different look, before they made UT so it might be insightful to include that info.